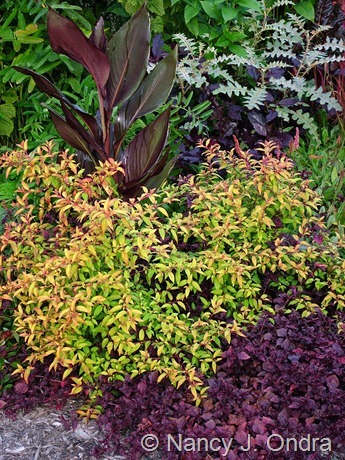 Finding plants with interesting foliage is always a treat, but if they’re discouragingly expensive or too fussy to grow successfully, the thrill can go off pretty quickly. So these days, I turn first to seed catalogs to see what I can grow for myself before I start hunting through online nursery listings or visiting local garden centers. Here are a few of my favorite foliage finds that are easy to start from seed and easy to grow in the garden, too. 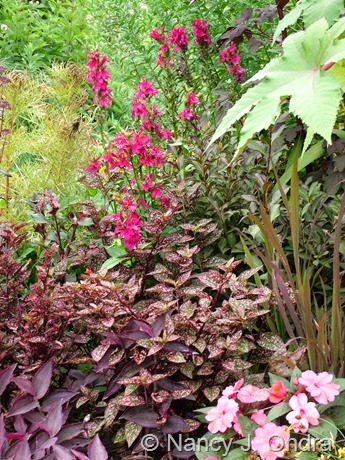 Back in the early 90s, tender perennials were all the rage in the Philadelphia area: particularly coleus and the tender salvias, but also the various species and selections of Plectranthus. Before that, we mostly knew Plectranthus through the houseplants commonly called Swedish ivy (P. oertendahlii and P. verticillata). Suddenly, we were finding and trading maybe two dozen different plectranthi (or, um, plectranthuses, I guess): many with beautiful foliage and/or wonderful spicy scents. 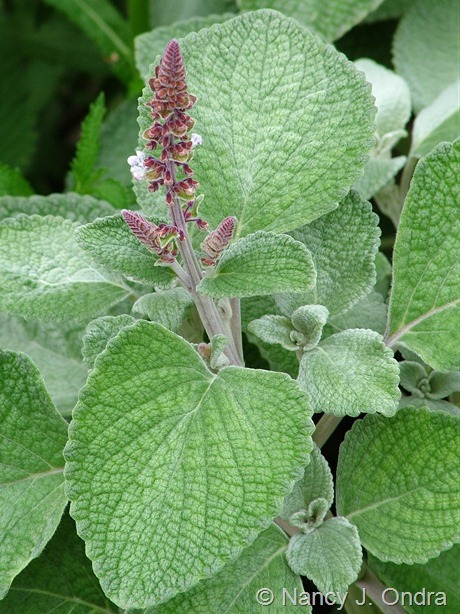 It’s been a long time since I’ve found more than one or two of these for sale around here, though, so I was delighted to see that one old favorite – silver spurflower (Plectranthus argentatus) – is now readily available as seed. This is one to grow not for its scent but for its appearance. 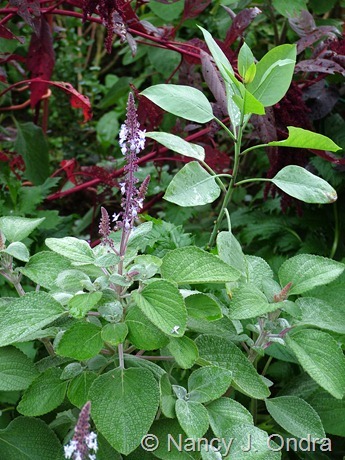 It looks much like a cross between a coleus (Solenostemon scutellarioides) and lamb’s ears (Stachys byzantina), with the upright, branching habit of the coleus and the fuzzy, silver/gray/green foliage of lamb’s ears. The leaves look more green during rainy spells, but they’re silvery gray again when they dry out. Grown from seed, silver spurflower reaches about 2 feet tall and wide by the end of the growing season. 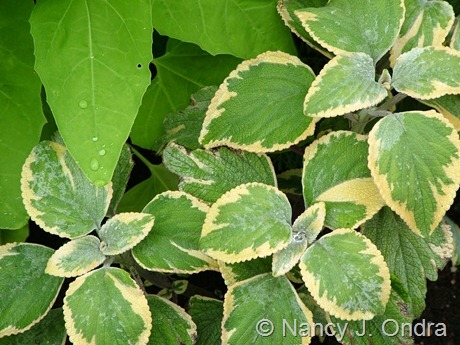 It thrives in sun but also grows well in shade (with a more open habit there). 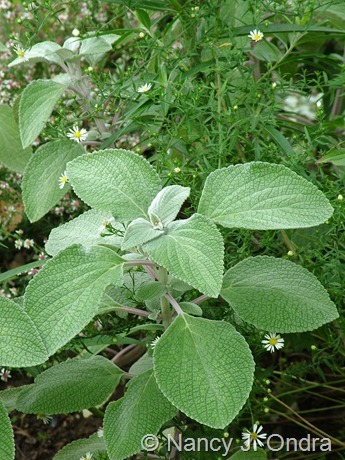 It’s also much more tolerant of moisture than many other silver-leaved plants. 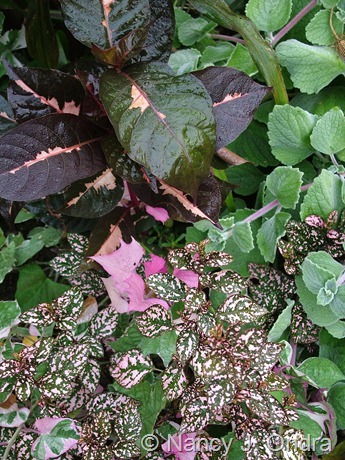 The purple-tinged buds and pale blue flowers are kind of pretty, but, as with coleus, you might choose to keep them clipped off to better show off the leaves. Silver spurflower looks great with many other colors, especially deep red to purple leaves and flowers, deep to bright greens, and crisp whites. There’s also a pinkish tinge to the stems which makes a pretty echo for rosy pink blooms. If you have luck overwintering tender perennials indoors, you could take cuttings in late summer to keep silver spurflower going from year to year; otherwise, treat it as an annual and buy new seeds each year. (I’ve not yet had it set any seed.) Sow indoors under lights in mid- to late March and keep the pot warm; on a heat mat, the seed usually sprouts in less than a week. Online seed sources include Summer Hill Seeds and Thompson & Morgan. (These and other sources list the plant as P. argentatus ‘Silver Shield’, but I suspect that’s a made-up name, because I can’t find any information on how ‘Silver Shield’ differs from the straight species.) If you’d rather buy started plants, check out Digging Dog or Avant Gardens. There’s also a vegetatively propagated, variegated version of silver spurflower called ‘Hill House’ (shown below); unfortunately, I can’t find any current online retail sources. Polka-dot plant (Hypoestes phyllostachya; also listed as H. sanguinolenta) is another foliage favorite that I first learned as a houseplant. About 10 years ago, I found seedlings for sale as bedding plants, and they worked so well in the garden that I haven’t been without them since. It used to be that the leaves were mostly green with distinct pink spots. Now, I always look for the ‘Splash Select’ series, with leaves that are mainly pink, rose, red, or white, with just a bit of green. From the time they are tiny, the seedlings are showy, and you know right away what colors you have. The plants usually reach a bit more than 1 foot tall. They have a bushy, upright form if you give them room to fill out. In crowded borders or containers, they can weave themselves up through most companions. Polka-dot plants produce small purple flowers as the summer progresses (you can see a few in the shot below if you look closely), but they’re not especially noticeable; really, it’s all about the leaves. The plants adapt to a range of light conditions. Here (in southeastern Pennsylvania), I’ve had them do well in full sun, but they needed regular watering to prevent them from turning crispy on the edges. They’ll also grow in full shade, though they tend to be somewhat leggy and less colorful there. A site where the plants get some sun and some shade during the day seems to be ideal. 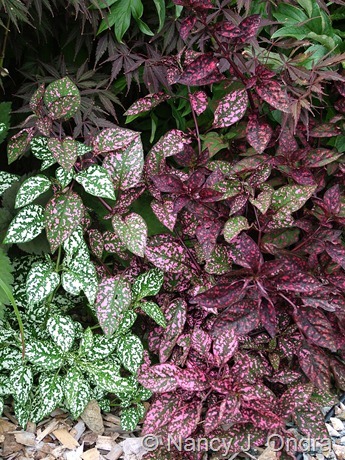 Because they’re so adaptable, polka-dot plants make terrific midseason fillers. If you start a packet of ‘Splash Select Mix’, you have a range of color options. 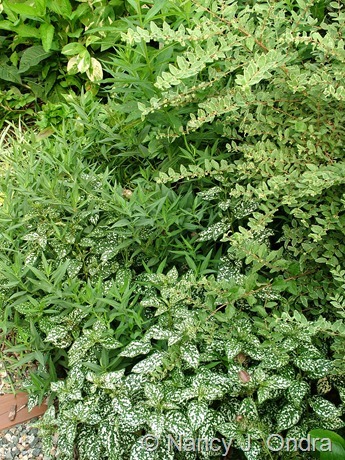 The white ones look great with white flowers and deep green or silvery foliage. 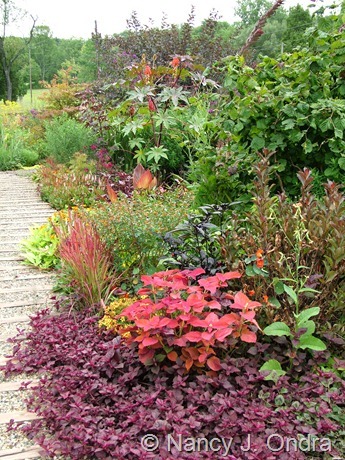 The pinks and reds, too, look good with silver, and with yellow, deep red, or purple foliage, as well as pink flowers. It’s easy to root polka-dot plants from cuttings if you want to bring them in for the winter, but as with the spurflower, I find it easier to start new ones from seed each spring. I usually sow them indoors in late March to mid-April but sometimes start another batch in early June if I’m planning to use them to fill gaps in July. Park Seed carries ‘Splash Select Mix’ as well as the white, pink, and red strains. You can also get seeds of ‘Splash Select Mix’ (as well as ‘Confetti Mix’ and the individual ‘Splash Select’ and ‘Confetti’ colors) from Seedman.com. 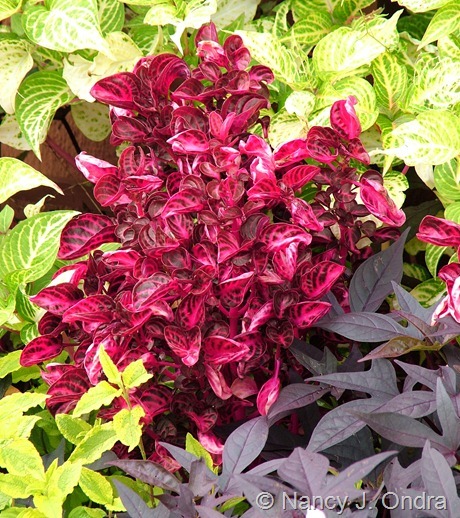 The last neat plant is another houseplant-turned-garden-star: a tender perennial commonly called bloodleaf, chicken gizzard, or beefsteak plant (Iresine herbstii). The species typically reaches about 1 foot tall here, in dense, upright clumps. 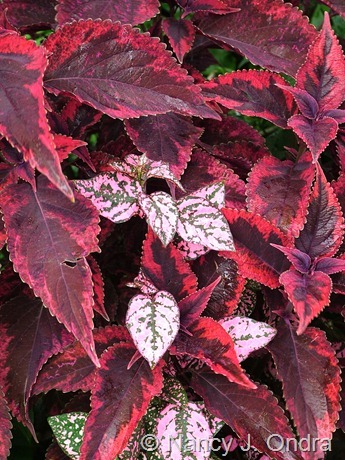 Bloodleaf looks a bit like a coleus, but it’s actually in Amaranthaceae, the amaranth family. The plants can produce clusters of tiny, creamy blooms, but I’ve never seen them flower here. 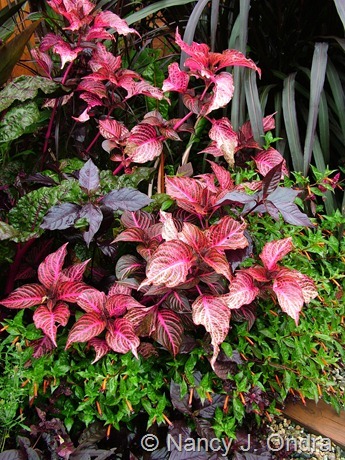 The leaves are bright and certainly colorful: definitely hard to miss in either a border or a container. 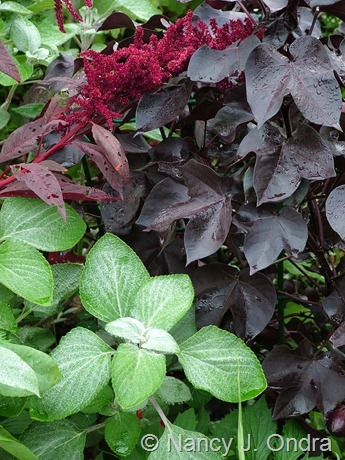 Last year, I found ‘Blazin’ Rose’, which is a giant-sized version of bloodleaf: the leaves are larger, and the stems are much taller – to about 30 inches. It’s usually listed without a specific epithet, but considering its larger size and pointed leaves, I’d guess that it’s a selection of I. lindenii, rather than I. herbstii. For a different color option, there are two yellow versions: I. herbstii ‘Aureoreticulata’, which has the same proportions and habit of the species, and I. lindenii ‘Formosa’ (shown below), which is comparable to ‘Blazin’ Rose’ in vigor and leaf shape. Both of these still have some pink, mainly in the stems and in the midrib of each leaf, but they read as bright yellow from a distance. In a border, ‘Formosa’ usually reaches 24 to 30 inches tall, but it can get even taller if it has something to lean against. 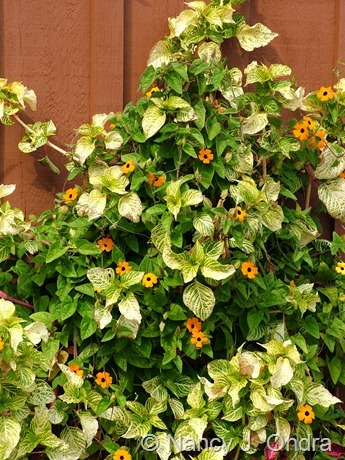 Paired with ‘Whopper Orange’ black-eyed Susan vine (Thunbergia alata) in the container shown below, it fully covered a 3 x 3 trellis and extended another foot or more beyond that by frost. All of these are fun to grow, but you rarely see seed of either I. herbstii or I. lindenii for sale, and the selections need to be propagated by cuttings (a very easy method, if you have a plant to start with). There is, however, a very pretty beefsteak plant that you can grow from seed: I. herbstii ‘Purple Lady’. 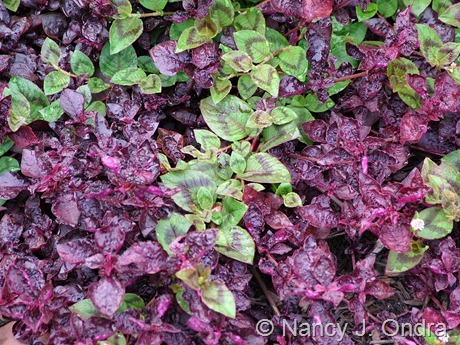 In the picture below, it’s the deep reddish purple foliage, mingled with the green-and-maroon leaves of pink knotweed (Persicaria capitata). ‘Purple Lady’ is upright in its seedling stage, but once it’s a few inches tall, its habit changes to distinctly horizontal. The ultimate height is 3 to maybe 6 inches tall, with a much wider spread: a single plant can grow 2 feet or more in all directions. 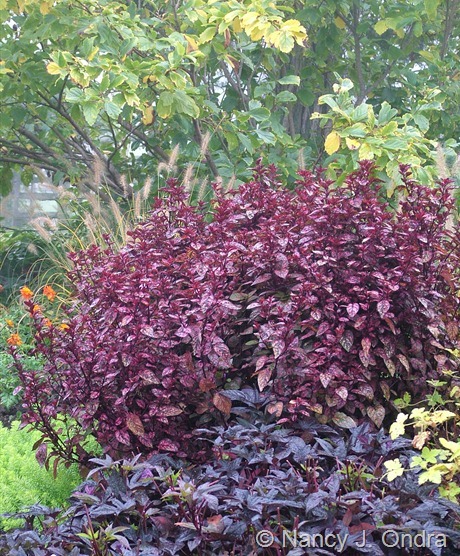 If you’d like some dark foliage to serve as a single-season groundcover in full sun to partial shade, ‘Purple Lady’ is the plant for you. 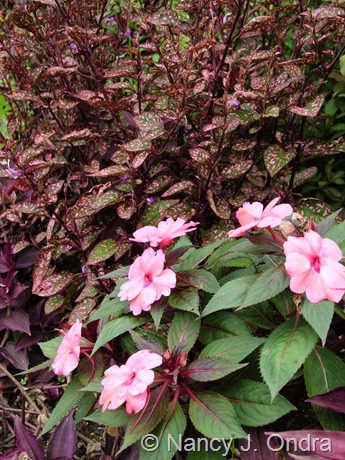 ‘Purple Lady’ thrives in full sun to partial shade, with the deepest purple coloration in full sun. (The plants shown here are more on the reddish side, I guess because they were getting a fair bit of afternoon shade from their taller companions.) I usually sow the seeds indoors in early to mid-April. A couple of online seed sources include Swallowtail Garden Seeds and Seedman.com. I am in awe, as always, of your incredible foliage combining talent. I will have to study that last photo for quite a while to see what I can learn. I am also amazed how many things you grow that we can grow too! That plectranthus argentatus is a work-horse in our yard. Thanks! I’m not sure where you’re located, Greenwords, but I’m in USDA Zone 6. These tender perennials are so versatile: those of us in the north can enjoy them as annuals and gardeners in warmer areas can have them all year long. I wish more of them matured as quickly as these three neat plants do. Located in Queensland, Australia (sub-tropical climate). I had no idea that gardeners in cold climates grew so many of these plants as annuals. The three you mention in this post all thrive here and you’re right, they do mature so quickly. Thanks again for a great post. Oh, that *is* interesting – thanks for letting me know! nice post and informative. any way I can grow from seed I do. Seeds sure aren’t as inexpensive as they used to be, but they’re still cheaper than buying started plants! I have to agree – the last photo is very beautiful. You manage to mingle dark and yellow leafed plants without the whole thing looking dotty. What’s the secret to that? Maybe another post in the making?! Hmmm…I don’t really have a plan for that – it just happens – so I’m not sure how I’d explain it. I’ll have to think about that and see what I can come up with. Thanks for the idea! Your plants – and your photos – are always so impressive that I have to look in all my garden books to see if there are some we can grow here. Unfortanelly I´m not interested in seeds (before this), so this time I´m only enjoying the photos! Hi Susie. Maybe you can find some of these for sale as bedding plants or houseplants where you are? Since we’re growing them for leaves, not the flowers, we can enjoy them all through even a short growing season, instead of waiting and hoping for them to flower before frost. Magnifiques compositions, et bien qu’il me faut mettre en traduction, j’en apprends énormément grâce à vous! Merci, Framboisine. Au moins vous pourrez profiter des photos. My friend grew lots of the ‘purple lady’ last year. It did really well for her. She now has rooted plants under grow lights. 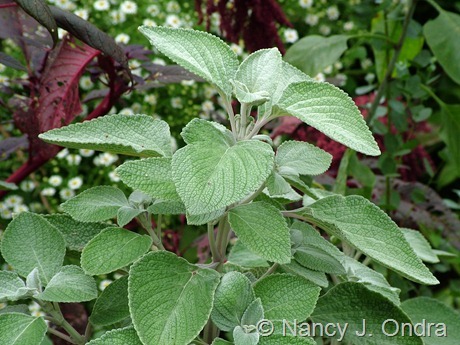 I started the ‘silver shield’ plectranthus from seed many years ago. I now root cuttings and winter them over. Works out well. I just love your gardens and look forward to new post on your blog. Keeping these tenders over the winter as cuttings is a smart way to go, Melanie. I’ve tried that, but I keep my house pretty cold through the winter, so I rarely have luck with that approach. Glasshouseworks has Plectranthus ‘hill house’. A bit pricey at 9.50. Oh, thanks, Melanie; I thought I’d checked them. They also carry many of the Iresine species and selections, though you have to hunt through the site for them. Nan, you really are astounding at both finding AND using interesting plants! I agree…when trying something out that you aren’t sure of, starting by seed is the way to go. 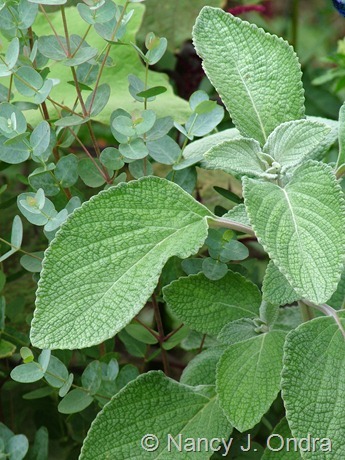 The Plectranthus is stunning…I would have thought for sure it was a Sage if you hadn’t told me otherwise. Even though I usually like taller plants, I’m totally enamored of that ‘Purple Lady’ Beefsteak Plant…what a great annual filler for new plantings! I must find seed for that one…I think it’ll be perfect for my new parking-strip garden this year! 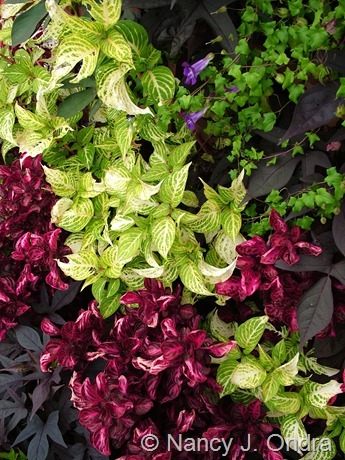 BTW…that last shot is divine…especially the Coleus (I think) coming up through ‘Purple Lady’…so vibrant! Is that a Black Pearl Pepper just behind them? Wonderful pics to brighten an otherwise bleak wintery day! I got my first Plectranthus on an end of season clearnace rack and fell in love with it. Mine is called ‘Mona Lavender’ and has darker purple flowers and dark green foliage tinged deep purple. I started cuttings of it and they seem to be one of those annuals that is super easy to overwinter (yay!). Must find that lovely variegated ‘Hill House’ next! Glad to hear that polka-dot-plant is easy from seed- never tried it before. This fall a fun and unexpected ‘spots n’ stripes’ combo happened in my garden, the result of planting ‘River Mist’ Chasmanthium with Tricyrtis ‘Miyazaki’. I loved it so much that I decided I needed to find more spotted plants this year to repeat the combo. The polka dot plant sounds perfect! I remember ‘Mona’! That’s one I haven’t seen around here for many, many years. Your combination idea sounds like great fun, Christin. The polka-dot plant should grow very well in the same conditions as the other two. Congratulations on being named Best Blog. I found your site through a random search and I wanted to let you know that the title is deserving. I was especially glad that you mentioned growing perennials from seeds. I was able to grow Heuchera from seed and each time I see them in the beds, I feel like a proud Papa. Cheers! Thanks for visiting, Kevin. You can get some really nice plants from heuchera seeds; good for you! Thank you so much for this wonderful blog. It is always a treat to read them. Last spring I came across my first Plectranthus (P. zuluensis) in a nursery in Germany and bought five plants. I loved it so much that I took seeds and cuttings. The cuttings are still in a glass of water inside my kitchen window. The glass is full of roots and the plan looks beautiful and not leggy at all. Indeed a great plant. Have to try the others too. Great to hear from you, Helene! 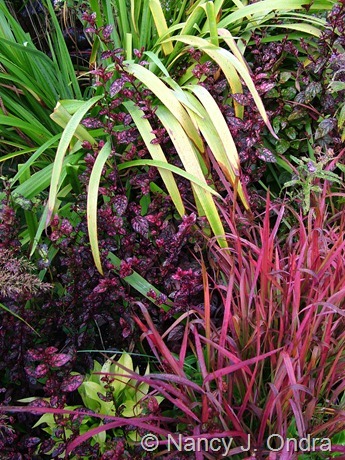 I miss growing P. zuluensis too: such lovely dark stems and nice purple flowers too. Best of luck with yours. You are famous here. And I am inspired again!! Thanks for the laugh, Katie. I kind of like “the seed lady.” In my neighborhood, I’m apparently known as “the lady with the llamas.” Don’t know where this “lady” nonsense comes from, though. (And gee, they’re not llamas, either, so technically, that appellation is wrong on two counts.) I’m glad to know you enjoyed the post, anyway! The thing I love best about this post is that most of these plants are now readily available – at least in my neck of the woods. You do interested gardeners such a great service by introducing awesome plants that may be overlooked at the nursery because they are unfamiliar. Is it ok if I say thank you on their behalf? All three of these neat plants are on my go-to list as well! Hi Laura! 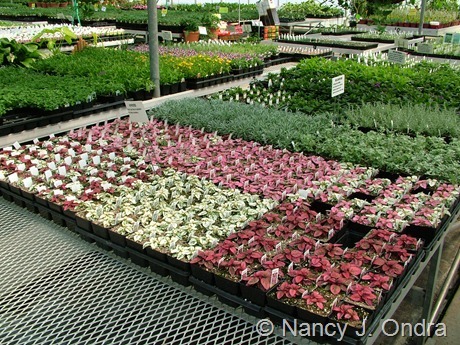 You’re lucky to have some great nurseries in your area. I can usually find these as plants at one place or another around here, but with seeds, I know I’ll be sure to have them, rather than just hoping I hit the right greenhouse at the right time. Either way, we’re doing our part to support the horticulture industry, right? Thanks for the lesson and for introducing me to silver spurflower. You have inspired me to look at my house plants in a completely different light! Hi Debra! Have fun experimenting with using houseplants in your outdoor gardens. Many of them adapt especially well to shadier conditions, but some can take quite a bit of sun too, if you get them used to it slowly. Another informative and beautiful blog. Your pictures are stunning. I look forward to seeing Hayefield in my Inbox. Thank You. What a nice thing to say, Sandi. It’s great to hear that you enjoy the posts. Thanks for reading! Oh, yeah, I need a plant called “chicken gizzard”! Although I generally stink at seed starting, I’m going to cross my fingers & order ‘Purple Lady’. It’s gorgeous. I agree completely: That has to be one of the worst common names ever! Good luck with ‘Purple Lady’. Maybe you’ll be able to find plants for sale this spring. Yep, I’m late to reading this, but your combinations and designs always knock my socks off! Your blog is the only one I will subscribe to because it’s always fun and exciting. One question, though: Do you not like rhodies? I don’t think I’ve ever seen one in your garden designs. I’m in Seattle, and the rhodie is ubiquitous here. Wow, thanks for the compliment, Chris! It’s not so much a case of me not liking rhodies as them not liking me. I have almost no shade, the surface soil gets quite dry in summer, and the property is wide open to wind, so most broad-leaved evergreens hate it here. Fortunately, there are plenty of deciduous woodies and herbaceous perennials that adapt just fine.